Round top over "X" base. 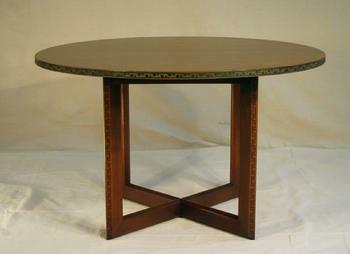 Taliesin design to table base. Exceptional copper "reverse Taliesin design" to edge. Signed with script signature. 48"D x 29H; three original 16" leaves with conforming copper edge detail. Excellent Original Condition; copper with highly attractive green patina. Top shows very slight sun fading, turning color slightly browner from red; leaves are slightly redder, toward original color.